The surgical staff at Staten Island Oral & Maxillofacial Surgery understands that facial injuries, by their very nature, can have profound physical and emotional impacts on our patients’ lives. In addition to the detrimental effects of facial trauma to the functionality of areas critical to vision, breathing, speaking, and swallowing, facial injuries can deeply affect a patient’s physical appearance. The compassion and expertise of our oral surgeons combined with the state-of-the-art technology and advanced treatment options available at Staten Island Oral & Maxillofacial Surgery help to ensure the best possible functional and aesthetic outcome for your facial structures following injury. As skilled oral and maxillofacial surgeons, Dr. Hoffman, Dr. Lam, and Dr. Stein are qualified to treat a broad range of injuries to the teeth, mouth, jaw, and key facial structures, such as the eyes, nose, and cheeks. What kind of facial traumas do our oral surgeons treat? How are facial lacerations treated? Facial lacerations must be treated carefully in order to preserve the functionality of facial structures and to ensure the best cosmetic results. When treating facial lacerations, our surgeons carefully repair the laceration with sutures while making sure that soft tissue injuries are not affecting important structures such as facial nerves, Salivary glands, or salivary ducts. 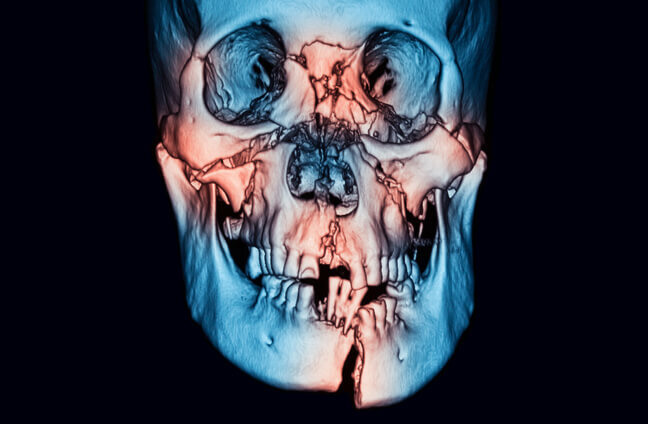 How are facial bone injuries treated? It is important that injuries to facial bones be treated promptly to ensure proper healing and prevent further damage to surrounding facial structures. The first step in treating facial bone injuries is to align and stabilize the bones to promote proper healing. Unlike other bone injuries, casts cannot be used to stabilize facial bones. Our facial surgeons use a series of small plates, screws, and wires to hold facial bones in place while healing depending on the location and severity of the injuries. They use as few incisions as possible when repairing facial trauma to ensure the best cosmetic outcome. How is a broken jaw treated? The specific manner of treatment of a broken jaw may depend on several factors, including the severity and specific location of the injury. In some cases, jaw injuries can be treated by wiring the upper and lower jaws together. In other cases, our oral surgeons can employ a “rigid fixation” technique that allows patients to be more comfortable during the healing process and return to normal more quickly than with the traditional wiring of the jawbones. With this technique, small plates and screws are used to hold the jawbones in place without the use of wires. How are injuries to the teeth treated? In some cases, the treatment of broken teeth might require the combined efforts and expertise of several dental specialists. The surgical staff at Staten Island Oral & Maxillofacial Surgery can treat fractures to the supporting bone structures of teeth, replant teeth that have been knocked out, and insert dental implants that anchor artificial replacement teeth. Handle the tooth by the crown, without touching the exposed roots. Place the tooth in salt water or milk to transport it. Contact Staten Island Oral & Maxillofacial Surgery as quickly as possible. How can I find out more about a facial trauma treatment? For more information on a facial trauma treatment, please contact Staten Island Oral & Maxillofacial Surgery to schedule an appointment with oral and maxillofacial surgeons David Hoffman, D.D.S., F.A.C.S., Lydia J. Lam, D.D.S., Steve Yusupov, D.D.S., M.D., and Mark Stein, D.D.S., M.D. at 718.226.1251.